I first went to Switzerland as an 18 year old backpacker with a couple of friends when we could just about afford to get by on bread and cheese from the local Migros. It is certainly not the cheapest destination by any stretch of the imagination! If you are planning on visiting then the Swiss Pass is a must. If you get the timing right you can often get good deals at low season (such as April between the winter skiing and summer hiking seasons). The pass gives you unlimited rail (and bus) travel for 4, 8, 15, 22 days or one month, “free” travel on the boat services on the lakes and admission to 470 Swiss museums. We have been able to get first class passes for the price of second class on more than one occasion too! Swiss trains are meticulously punctual, as one would expect from a nation famous for its precision watch-making, spotlessly clean and give you a fabulous vantage point from which to take in the divine scenery. If you are a resident of Switzerland or Liechtenstein, however, you don’t qualify – it’s purely to encourage tourists! Whilst the famous Glacier Express is undoubtedly a fantastic experience, you can get to many little towns and villages just by using the day to day Swiss trains. In a country of spectacular scenery, the Engadin Valley which twists and turns its way up to St Moritz is simply breath taking! So it was after taking the Glacier Express from Zermatt, we found ourself in St Moritz post Easter in what was definitely the “quiet season”. Que faire? The weather was glorious, still snowy with the frozen lake just starting to thaw. As St Moritz was bathed in sunshine, we decided to take the funicular railway up to Corviglia where according to the guide books there were excellent views across the mountains and a highly recommended restaurant. Unfortunately we arrived at the entrance to find the little railway was shut. We were there between seasons, which is why we paid only 30% of the full price on our hotel room, and the funicular was now undergoing maintenance in time for the summer season which was due to begin in early June. The best laid plans…. However we also met there an equally disappointed lady by the name of Barbara from Munich who asked us if we’d be interested in sharing a taxi with her out to a little place called Diavolezza . Here she was sure the cable car would still be open and we could get up into the mountains. This “short ride” turned out to be about a half hour journey during which time the taxi meter clocked up a not inconsiderable sum and we began to ponder whether we’d have to hike back to St Moritz as the bill (even shared with Barbara) was likely to use up most of our disposable cash for the day. It was only after we arrived at the foot of the little ski field that we spied a railway station out in the middle of nowhere and this is when we discovered the Bernina Express. Out in the wilderness of the Piz Bernina, the Rhaetian Railway, part of the extensive SBB network run trains! In fact they run them all the way over the mountains and down the other side into Northern Italy. The Swiss Pass covers your tickets and if you wish to upgrade to the panoramic cars then you pay a small supplement of 5 Swiss francs per person. The next day we decided to do the trip in full – it was a quiet Sunday and was clearly a popular outing for locals and tourists alike, but the train was not unpleasantly crowded. It would have to be just about one of the most incredible journeys we have ever taken and not surprisingly the Bernina Express line has UNESCO World Heritage Status (from Thusis to Tirano). It technically starts from Chur, the regional capital of the Graubuenden canton, though of course you can join at any point along the way as it is a scheduled train service and not only for tourists, unlike the Glacier Express. From Chur the train gradually winds its way up to the top of the Bernina Pass. It is not a rack railway as you might expect but is one of the steepest “adhesion” trains in the world and we were very glad it adhered to the line as there are steep inclines and jaw-dropping ascents and descents along the way. The Upper Engadin Valley is ruggedly beautiful. You pass through pretty little alpine towns such as Celerina and Pontresina before coming into sight of the Bernina Alps and the magnificent Piz Bernina, the highest peak in the area at 4049 metres and indeed the highest peak in the whole Eastern Alps. If you have time and have made an early enough start you could get off at Diavolezza, as we had done the previous day and head up 3000 metres by the cable car to marvel at the scenery and breathe in the therapeutic mountain air (or have a Swiss hot chocolate at the restaurant)! From Diavolezza the train (certainly not an express by this stage!) slowly climbs its way past glaciers, mountains and lakes, such as the strangely beautiful Lago Bianco, to reach its highpoint of 2,253 near Ospizio Bernina. Then it begins its dramatic descent into the Poschiavo Valley. Here there is a change, imperceptible at first but you gradually realise you’re coming into warmer climes with a distinct Italian feel. Indeed this valley, although part of Switzerland, was for many centuries cut off during the long winter months from the rest of civilisation so the Italian language, traditions and customs have all survived intact to this day. As you come into the little town of Poschiavo itself the train actually runs along down the centre of the main street. We had been through many tunnels and across many bridges on our journey but just before we reached our final destination at Tirano, there was another surprise by way of the impressive Brusio spiral viaduct. This feat of engineering helps to overcome the problem of the steep incline and enables the trains to weave their way seamlessly up and down the valley. Two and a half hours after we had set out we drew into the little station at Tirano. The locals have certainly taken full advantage of the business opportunity afforded by the arrival of hungry travellers needing refreshments! You step out from the sleepy station into a small piazza brimming with pizzerias and gelati shops. We enjoyed a very pleasant lunch sitting out in the warm Italian sun, accompanied by a couple of glasses of the local vino and walked it off with a stroll around the town before heading back to catch the return train to St Moritz. 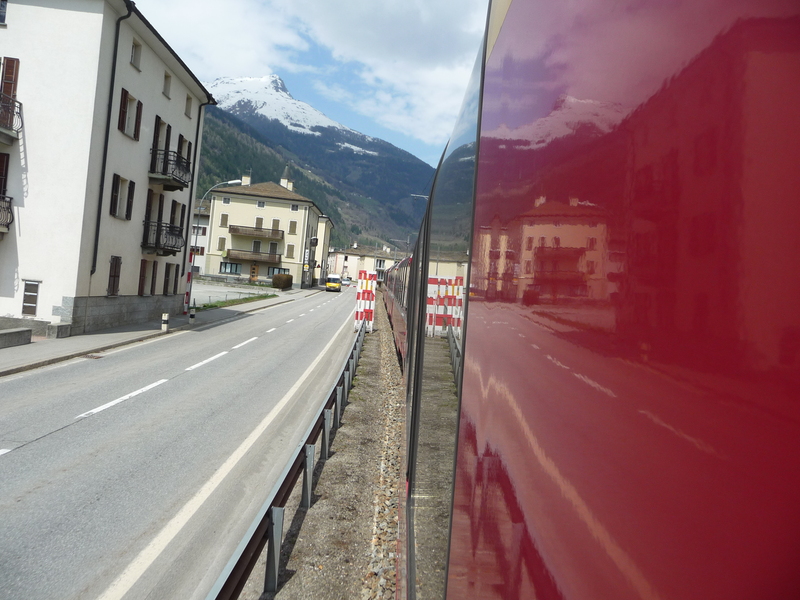 If you wish to travel on further into Italy, the Red Bernina Express Bus, connects Tirano via Valtellina, a valley famous for its wines, to Lake Como and then back into Switzerland and Lugano. Whilst the Bernina Express trains run all year round, the buses only run during the summer months so check the times before planning a trip! The Bernina Express takes you through many changes of scenery, languages and cuisine in such a relatively small time and is currently celebrating its 125th anniversary year. The languages of southern Switzerland merit a post in themselves and will be coming up on the blog soon! In the meantime we spent a very relaxing return trip trying to spot marmots, which we had been told were a feature of the area and could usually be seen on warmer days “snuggling in the sun”. 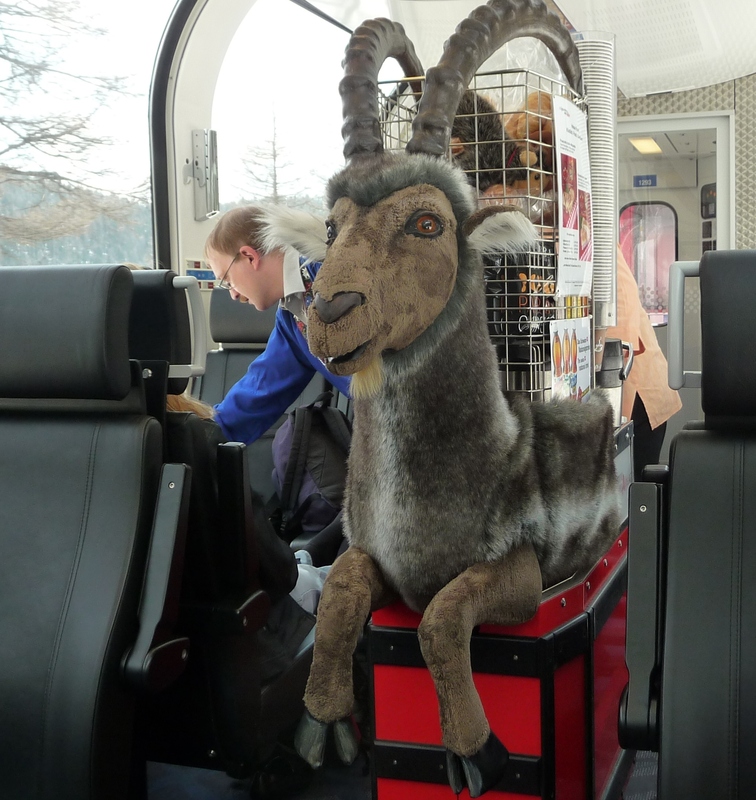 Alas we failed to see any but we did come across an ibex on the train …well in a manner of speaking! What an amazing train journey Rosemary – I would absolutely love to do this. Seeing glaciers, mountains and then going into the valley just sounds so fascinating. We’ve only been on the trains around Interlaken and not a “special” journey like this but even those trains were really impressive. This is definitely one to go on my list!! Good advice – especially with winter coming up. May I include this post in my Weekly Blogger Round-Up? Thanks Rosemary yes I’d be very happy for you to include this post in your Weekly Blogger Round-Up! I’ve only just logged in this morning so hope I’m not too late – I will come over to your blog later today and take another look (I’ve signed up to get your updates). Both your blogs are wonderful! Switzerland is a particular favourite of myself and Monsieur Le Chic so am always happy to assist with anyone’s holiday or travel plans there! Thanks very much to Rosemary for including this post in her Weekly Blogger round up on Aussie In France. 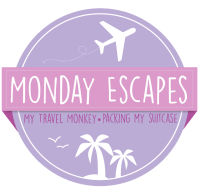 Head over to her blog for her wonderful insights on life as a long term Aussie ex pat in Paris and soon the Loire Valley! Wonderful landscapes! I would definitely enjoy this train trip 🙂 Thanks for sharing! Yes this is a great place to visit! Love the alpine areas – there are so many beautiful valleys in the mountains and the scenery is stunning! We actually did part of the Bernina Express run again a couple of months ago when we were staying at Lake Como and I’ll be writing up that day too in the near future!